Scientists are just beginning to discover and understand the waves and rhythms that move inside living things. Some waves you can watch, moving across a cell surface like a ripple in a pond. Others are rhythmic like a heartbeat. One wave could hold the key to helping brains heal after a stroke. Another reveals the surprising similarity between cells and a symphony audience. Advances in imaging technology and techniques increasingly enable researchers at EMBL and elsewhere to watch biological processes as they unfold. What they’ve seen shows that rhythm and motion – rather than discrete steps – are intrinsic to some of the most fundamental actions of cells and organs. It’s perhaps fitting that an exploration of waves would begin in the ocean. But the attention of Johanna Bischof, a PhD Student in the Lénàrt group at EMBL Heidelberg, is focused not on stormy seas but the egg cells of starfish. Bischof is watching waves travel across starfish oocytes, zooming in on these individual cells as they shiver and start to divide. She hopes the work will shed light on how oocytes develop into a fertilisable egg. Oocytes are cells that become eggs. They contain nearly all the instructions and parts to create a new organism and because of that, they’re comparatively large. And starfish oocytes are built to handle a certain amount of abuse because their mothers release them into the open ocean. That makes them easy to study. It also changes the way they divide. “The normal cell that’s dividing is very, very small. Everything essentially happens at the same time,” Bischof says. Not so in oocytes. Unlike a typical cell division, which results in two equally sized cells, oocytes split into a large cell that will become the egg, and a much smaller one. That helps conserve the nutrients and cellular machinery the embryo will need to grow. Right before they split, the oocyte’s surface seems to shiver with a contraction that moves across the cell in a wave. Scientists have known about these shivers and waves since the mid-1970s, but Bischof has finally begun to connect them to the cell division process. The contraction, she says, is a result of the chemical signals that organise the cell for division. In smaller cells, those signals reach all parts of the cell at essentially the same time. But oocytes are larger. “In these oocytes, the mixing isn’t fast enough for everything to happen at the same time,” explains Bischof. Instead the cells are so big that the waves are visible as a ripple across the cell’s surface that looks like a water balloon moving in slow motion. 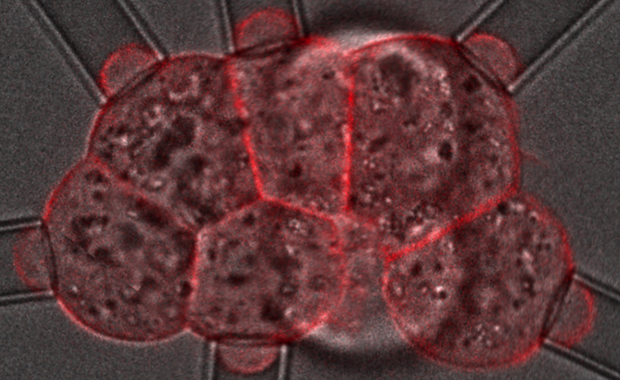 By tagging parts of the cell with fluorescent markers, Bischof can watch the oocyte organise itself internally for division. She’s found that the wave is related to the asymmetry within the oocyte, which creates a gradient of chemical signals that the wave follows. She has even found ways to control the wave, reversing it with chemicals, blocking signals to certain parts of the cell, even changing the shape of the cell and how it moves to its internal rhythm. These waves are helping her learn more about how these important cells divide. Reduce the magnification, and a zebrafish larva swims into view. With their transparent bodies, zebrafish, native to stagnant pools, slow moving streams and rice paddies in Asia, are one of biology’s favourite model organisms. Looking down into the developing brain of a larval zebrafish has shown Francesca Peri’s team at EMBL that a wave of chemical signals is responsible for raising a mayday call to emergency responders in the nervous system. Developing brains produce far more neurons than needed, while in adult brains neurons die or get diseased. Things would get very messy if it weren’t for the existence of special immune cells called microglia, who race to clear up the debris of dead and damaged cells. They allow new brain tissue to form and work so efficiently that scientists can’t even spot dead neurons because microglia eat them too quickly. Instead, watching the zebrafish brains directly has shown the team that when neurons are injured, a chord of three chemical signals —glutamate, calcium and adenosine triphosphate (ATP) — rolls out from the injury like a thunderclap. Peri has found that this gradient of chemicals created as the wave moves outward and loses strength is the key to attracting microglia to the correct spot. They are activated by ATP and move to where there’s more of it, leading them to the damaged cells. Brain injuries in humans prompt the same chemical wave and the same response by microglia, although it’s not yet understood in as much detail. But in the case of a stroke or other large trauma, microglia can actually be counterproductive. “When you have a massive response of microglia and other cells, scars can form that prevent regeneration,” explains Peri. Just as when you get a cut on your skin, a scar forms to help protect injured tissue. But it also can prevent regrowth of new tissue. So Peri’s research on these tiny larval fish could ripple out into human health. Learning more about how microglia find injuries could teach us ways to help them leave the wound sooner. That might give the brain a better chance to regrow and recover from trauma. Moving out of the water and into mammals, we find the motion of cells changes. In mice, Takashi Hiiragi’s group at EMBL Heidelberg has observed what they call “cellular dancing” and it could shed new light on embryonic development. Jean-Léon Maître, a postdoc in the group is watching a crucial phase in the development of the mouse embryo. It’s called compaction: when a loose ball of cells draws together and the embryo’s structure begins to emerge. At this stage each cell shimmies to an unheard beat, a wave travelling across its surface every 80 seconds. But although these cells dance next to each other, they don’t necessarily dance together. It’s as if they’re listening to the same song wearing headphones, but each one has pressed play at a different time. One beat every 80 seconds would be pretty slow in a dance class or nightclub but that’s pretty fast from a biology perspective (the contraction waves Bischof studies, for example, can take 10 minutes). To follow it, Maître needs confocal microscopes that can capture images very quickly, and powerful processing software to piece the images together. One of the mysteries Maître hopes to solve is that while all pre-embryonic cells dance, some of them eventually stop, while others continue. He thinks that may be one of the clues to their significance in embryonic development. By manipulating the cell’s chemical signals, Maître has discovered that the contractions are caused by a protein called myosin, the same protein that works like a motor in our muscles to make them contract. It is also the same protein that drives the contraction wave in starfish oocytes. He can now control the cell contractions’ size and can turn them on and off. Next he hopes to change their tempo. If we can learn to control their rhythm, he says, he thinks it may shed light on where they’re coming from. Zooming out again, we find ourselves looking at the whole mouse embryo. As it grows and the animal takes shape, the waves and patterns become even more complex – and even more important. The act of forming each vertebra in a mouse’s vertebral column or spine requires exquisite coordination between cells, guided by repeated pulses of chemical signals. But it’s not a single wave or a simple rhythm, as Ina Sonnen, an EMBL Interdisciplinary postdoc in the Aulehla and Merten groups, has identified. Waves of signals appear travelling towards the head along the cells of the vertebral column-to-be. Sonnen says it looks a bit like the Mexican waves fans do in football stadiums, each person standing up in turn. What’s remarkable, she explains, is that there are three different signalling machineries, each making its own wave of activity. Sonnen is working on testing the idea that, for the cells that make the vertebrae, it’s not any one of these chemicals that tells them what to do, but the relationship between the three. Sonnen is using microfluidics to explore that relationship. The cutting-edge technique allows her to send chemical signals to the embryonic cells, carefully controlling when and where they reach her sample, and allowing her to replicate and manipulate this dynamic signalling in ways that weren’t possible before. 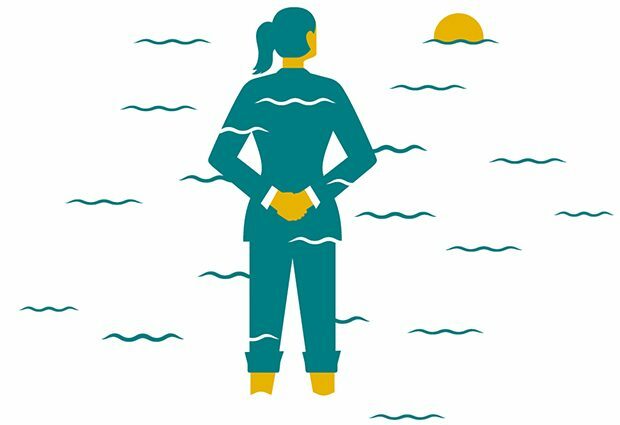 What she’s finding makes her think that the reactions of the cells are attuned to the peaks and troughs in the waves— the rhythm of the chemical signal. And while Sonnen has been deciphering the way the waves work, EMBL group leader Alexander Aulehla has been trying to figure out how waves start in the first place. Unlike during Mexican waves in a stadium where fans see their neighbour and decide to stand up in time, Aulehla says, it remained unclear how thousands of cells in an embryo could get in sync to generate a wave. Together with Charisios Tsiairis, a postdoc in his group, they set up experiments aimed at distinguishing whether a ‘conductor’ is directing their action or if, alternatively, cells have a way to organise themselves. To find out, they took a sample of embryonic tissue in which the wave pattern was already established. They separated individual cells, mixed them up and put them back together in a dish, recording their rhythm using confocal microscopy. At first, as expected, what they observed was chaotic – each cell seeming to signal at random when compared to neighbours. But over time the cells created a new rhythm, and not one guided by any individual cell, creating new wave patterns. Aulehla says their experiments demonstrate that cells can indeed self-organise to produce the waves that are necessary to create vertebrae. What his team needs to do now, he says, is catch the first wave as the embryo develops. His lab is currently teaming up with the Hufnagel lab at EMBL to build new microscopes that are fast and sensitive enough to do that. If they can, they might be able to learn how the cells in the growing embryo develop their pattern, advancing our understanding of how cells and organisms control complex processes like the one that makes vertebrae (see page 5 for more). It would also be a reminder of how much is opened up by advancements in microscopy—and how much more there is still to discover. EMBL researchers and others are giving new meaning to the rhythms of life. Not the repetition of days and weeks, or the passage of seasons, or the rise and fall of a lifetime. They’re exploring at the level of embryos and cells and molecules the order that guides some of the fundamental processes that make our existence possible. This article was published in the Spring 2016 issue of EMBLetc magazine.